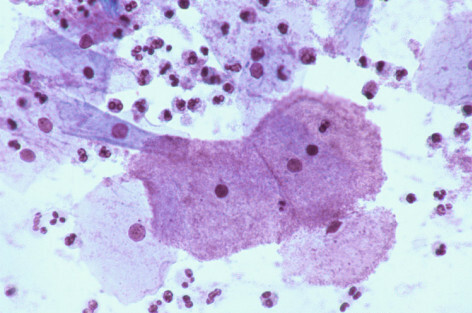 Bacterial vaginosis (BV) is a disruption in the normal vaginal flora and is commonly caused by the gram-variable coccobacilli Gardnerella vaginalis. Some studies show that bacterial vaginosis is found in 29% of women aged 14-49 years in the U.S. (source). Colonization of this pathogen leads to loss of lactobacilli organisms, and an overgrowth of mixed anaerobic organisms which causes the symptoms discussed below (fishy odor, discharge, etc). Sometimes it is not a problem: it is important to realize that a significant portion of women are colonized with Gardnerella vaginalis but do not have any symptoms of BV. Chief Complaints: the constellation of chief complaints/symptoms experienced by patients with BV are often characterized as “vaginitis” by medical professionals. Lack of erythema/edema given that BV is typically not an inflammatory condition. Wet mount: microcopic ananlysis of the patient’s vaginal discharge on a wet mount can reveal the presence of clue cells. Typically there will not be many white blood cells present. Homogenous thin white/grey discharge coating the vaginal walls (no inflammation will be present). Greater than 20% clue cells present on wet mount microscopy of vaginal discharge. Positive whiff test: fishy or amine odor of vaginal discharge alone or after addition of 10% potassium hydroxide (KOH). Adding KOH should increase the intensity of the smell. Keep in mind that in the absence of any type of vaginal odor the diagnosis of BV is very unlikely. Metronidazole given either orally or as a gel OR Clindamycin cream is used to treat symptomatic women. It is difficult to anticipate infections for BV, however abstaining from practices such as douching could potentially be of benefit. Avoiding anything that might upset the vaginal flora ideally should be avoided (however these causes are not that well characterized). While not an STD within itself, BV can sometimes be a result of new sexual partners (which might disrupt the vaginal biome). Make sure to obtain complete sexual histories from your patients. This archive organizes example questions on this topic.